Within the dark and terrible lands of Ravenloft, vampires reign and shapeshifters abound. Fearsome creatures prey upon a terrorized populace beneath the ghostly moon, while ancient evils lurk unseen in grim, frightful abodes of darkness. The fell host resides within, their secrets laid bare - both old favourites and new entires - all updated to be fully compatible with the version 3.5 rules of the d20 system. 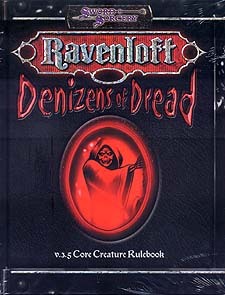 In the grand tradition of the Monster Manual and the Creature Collection series, Denizens of Dread presents an array of malign and malevolent creatures endemic to Ravenloft. Heroes, prepare!